TaxCloud is a highly available, secure, remotely invoked web service that gives you complete control over the presentation and reconciliation of all the steps in managing sales taxes for your customers’ purchases. TaxCloud offers its services to AmeriCommerce online store merchants free of charge if certain conditions are met. They can offer their services for free because in these situations TaxCloud funds it operation based on commissions paid by select U.S. state governments. Are there charges for using TaxCloud? Note: AmeriCommerce is listed as SparkPay when you are selecting your platform during registration. When you register with TaxCloud you will have the opportunity to specify sales tax collection details. 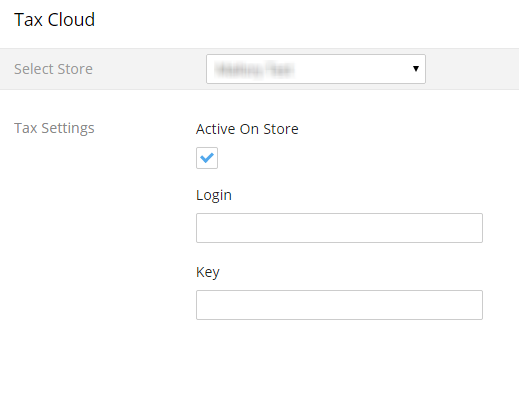 As part of the TaxCloud registration process you will be asked to enter the URL of your web store(s). This is done on the “Websites” page. When you enter a website, a window will open from the bottom of the page. That window will include the API ID and API Key. That information needs to be noted and entered as part of your AmeriCommerce online store/TaxCloud Settings (see below). Before your web store can go live with TaxCloud you will have to complete a test order. This will allow us to confirm that your settings are correct. When you place the test order our system will perform a lookup, authorize, and capture. The capture only takes place when an order is marked as shipped or closed. 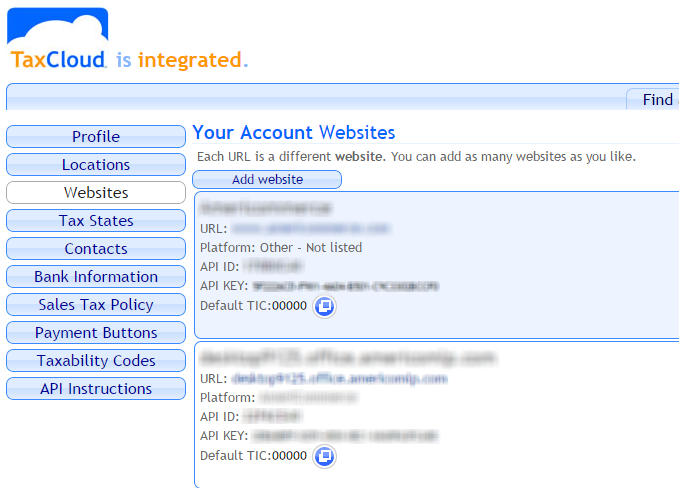 After you have done this there will be a "go live" button available for your website in TaxCloud. Once you click this button all of your transactions will be recorded as live transactions in the TaxCloud system. There are no restrictions, so feel free to test as much as necessary. TaxCloud makes a series of reports available to you at the close of each month. You will find these reports in the “Transactions” and the “Filings” tabs of your TaxCloud account. You can also download your monthly detailed data in CSV format (look for the CSV button in the Transactions tab). TaxCloud can even file your state sales tax returns for you. For more information on this consult the TaxCloud site. An important step in setting up your website for accurate sales tax collection is assigning the correct Taxability Information Code (TIC) to the goods and/or services that you sell. In most states there are categories of merchandise that are exempt from taxes or are taxed at a different. rate. For example, in New Jersey, clothing is exempt from sales tax. To ensure that customers are charged the correct rates, you need to maintain up-to-date and accurate TICs. TaxCloud has several tools to make this easy. You can use one of two approaches to creating TICs: store level default setting or item/group level settings. How to setup on the AmeriCommerce online store side. Click Save at top right of screen. What tax options does AmeriCommerce online stores provide? Is there a way to designate shipping as non-taxable? We don't have to charge our nexus customers shipping because we offer them the option to pick up but there is no way I see in tax cloud to set the shipping code separately. For whatever reason before their major service outage earlier this year, tax was not charged on shipping, but after they restored service, tax was automatically charged to our customer on it and we can't find any way to change it in the site.